The Sensitivity to Funding Index reveals key insights into the dependancy prospective students have on funding options when they consider their education. One of the real advantages of this Index, is the ability to see the impact of changes to the sector in real time– such as the Victorian Government’s ‘Free TAFE’ Scheme. As part of the Student Sentiment Index, the Sensitivity to Funding Index is important in understanding how access to funding impacts the decision making process of prospective students, such as this impact of gender and location–which this article will examine more closely. Another major take away, is the benefit of seeing changes to prospective student’s responses when a change is made to the sector that could influence their decision to study. The below chart shows the level of sensitivity each state experiences to funding options, which forms part of the Student Sentiment Index. One interesting insight of this article, is how Victoria and Western Australia have the lowest score on the index, which indicates that prospective students in these states are less reliant on funding when they decide to study. On the other hand, the two states which experience the highest sensitivity to funding when it comes to study, are South Australia and Queensland. 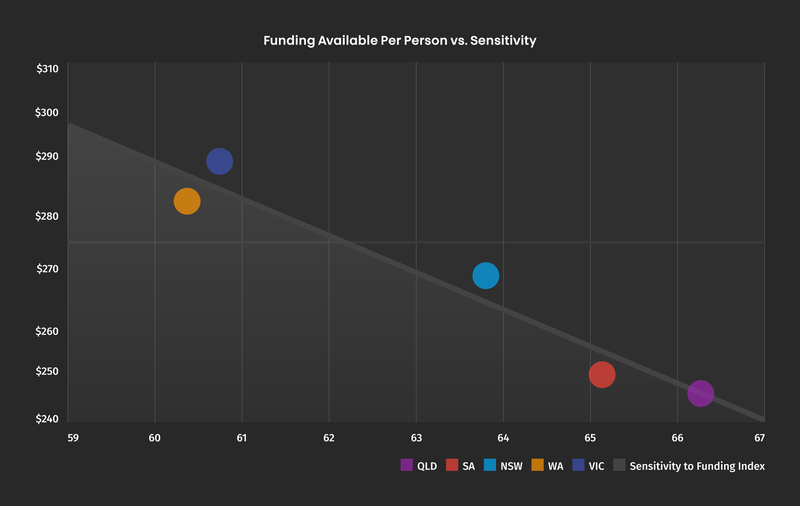 What we can see in the Index, is that respondents in South Australia, New South Wales and Queensland are the most sensitive to funding changes; whereas Victoria and Western Australia are less influenced by this. When we break down the state funding on a per person basis; we see a strong correlation between funding per person (by population) and our Sensitivity to Funding Index. For example, the Government expenditure for education is the highest proportionally for Victoria and Western Australia, where there’s approximately $185 and $178 of funding available per person, respectively. When we compare this with respondent’s sensitivity to funding, we can see that these states also score the lowest, indicating that, the more accessible funding is to prospective students; the less impact funding has on their decision to pursue a course. Another interesting finding that arose in the past two months, was the impact of the ‘Free TAFE Scheme’ announced by the Victorian Government in early June. This initiative provides 50 TAFE courses and apprenticeships free for Victorians and has been widely publicised. One of the advantages of the Student Sentiment Index is that it acts as a leader indicator of overall perception in the sector, whereas other data relevant to the sector is typically released on a yearly basis. So when a change comes about such as the ‘Free TAFE Scheme’, we can see the impact this has on prospective students as it happens. 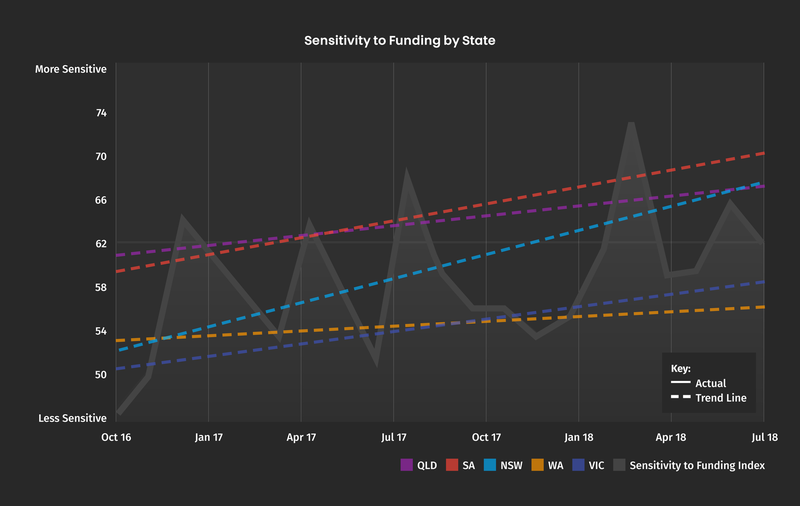 When analysing the responses following this widely-publicised announcement, what can be seen in the Sensitivity to Funding Index is a 10% drop in the underlying trend for Victoria. This illustrates how changes to the funding landscape can immediately impact the perceived dependence on financial assistance of prospective students. As funding becomes more accessible, which is the case for Victorian TAFE students, we can see this sudden drop in sensitivity. The Student Sentiment Index is a leading indicator of change in real-time. Subscribe below and stay up to date with future data publications and insights.